Please understand that after 4:00pm on Thursday, as our league players take precedence, the last point anyone will be let out to play is 3:00. Thank you for your understanding. Tuesday is Ladies Day and Wednesday is Seniors (55+) Day and Friday is Father/Son Day! 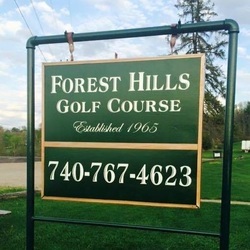 $10 for 9 holes and gas cart or $16 for 18 holes and gas cart. Military Discount- Past and present military members receive 50% off their second 9 holes, every day, with proper identification (DD214, VA ID, Retiree ID or Current CAC). Rental Clubs are available for $3.00. Refunds or rain checks are available on a case by case basis but will NOT be given after the conclusion of the 5th hole under any circumstances. We accept Visa, Mastercard and Discover cards along with Cash. Personal checks are accepted on an individual basis, however, no out of town checks will be accepted.